Plan your bathroom space – On graph paper or using our free online bathroom design tool draw a plan of your current bathroom layout. Alongside your bath/shower, wash basin and toilet, include aspects such as doors, windows, radiators and, where visible, plumbing, electrics and waste pipes. If you’re keen to change the layout or add a new bathroom feature, such as a shower enclosure, this will show what space is available. If the design appears cramped, consider re-locating bathroom fittings to optimise space, or if your budget allows, look at ways of extending your bathroom. Burgbad’s Eqio bathroom range is as elegant as it is practical. Many people like the idea of adding a separate shower but this can sometimes squeeze the space too far, resulting in a small unpractical shower and small bath. In this case, we recommend opting for one or the other or exploring alternatives such as adding an en-suite to the master bedroom. Think storage – For a calm, uncluttered feel consider where you can store towels, toiletries and cleaning products out of sight. Today’s bathroom suites come with a wide range of co-ordinated bathroom furniture, including vanity units, side units and shelving. As well as creating a stylish, seamless finish to your bathroom, you can choose from a wide variety of materials and finishes. Take a look at Villeroy & Boch’s range for inspiration. Bathroom accessories – Investing in high-quality brassware (taps, mixer taps and showers), shower enclosures and mirror cabinets will make a real difference to the final look and feel of your bathroom. Updating these features won’t just breathe life into your bathroom but add a generous dose of comfort and luxury too. Swapping a spluttering shower for a premium thermostatic shower will create a spa-like showering experience. Whilst fitting a frameless glass shower screen will make an elegant focal point and make your bathroom feel much bigger. Installing an illuminated mirror cabinet will add mood lighting and conceal cosmetics beautifully too. Investing in branded bathroom products also ensures availability of spare parts and servicing in the future. For the ultimate showering experience check out showers and accessories by manufacturers Crosswater, Hansgrohe and Majestic. Or for high-impact bathroom mirrors Swiss-made Schneider mirrors and cabinets add the perfect finishing touch. Supply-only or complete bathroom installation – Opting for supply-only means that you source your own plumber to fit your chosen bathroom suite or shower. Bear in mind that if you require additional work, such as carpentry, plastering, re-wiring or tiling, you may have to hire other skilled tradesman to carry it out. If available in your area, we recommend using our in-house installation services where we fully project manage your bathroom design and installation from start to finish. As well as saving you time, our professional installers have wide experience of the luxury bathroom products and appliances you order, ensuring they are fitted to a very high standard. 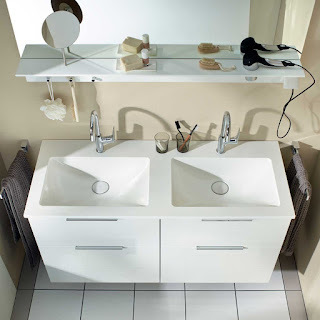 Choose your bathroom supply option – we can deliver or undertake complete professional installation.